It is 2002 and the effects of 9/11 are being felt across the Middle East as the global war of terror unfolds. Musab, a former low ranking jihadist and political exile, is lifted from a street in Denmark and renditioned back to Egypt. After a few months he escapes and disappears. Makana, a former detective inspector in Sudan and now private investigator in Cairo, has been hired by a suspicious wife to track her husband. The only woman the lawyer visits is a young girl in a private clinic that dies shortly after. It turns out that the girl is Musab’s daughter, apparently burned to death in an honour killing. An old family friend, the lawyer had been helping her and he now asks Makana to track down Musab. The trail leads to Siwa, a small, isolated desert town from which Musab had fled many years earlier. Makana arrives shortly after the death of a local magistrate and is enrolled to help in the investigation by the local police sergeant. The town is full of dark secrets, but finding answers and justice proves difficult when no-one wants to discuss the past and its role in the terror stalking its streets. 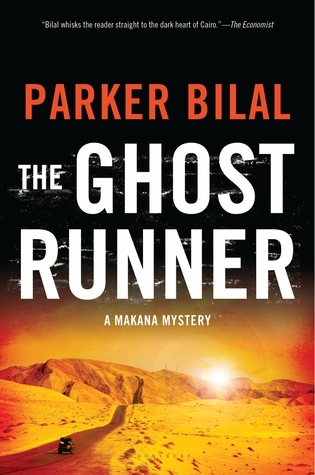 The Ghost Runner is the third instalment of the Makana series set in Egypt. In this outing Makana investigates the murder of a young girl, suspecting her former terrorist father of committing an honour killing. Travelling to a small town in the desert he tries to piece together the family history and pick up the trail of the father. His arrival coincides with a series of deaths and it is clear that the legacy of an event many years earlier is unfolding. The Makana series has a number of appealing strengths that are once again evident in The Ghost Runner, such as its atmospheric sense of place, its contextualisation within Eygpt’s politics and history, and its well-drawn characters. In particular, Makana is a detective worth spending time with – a clever, taciturn man haunted by the loss of his family in his flight from Sudan who is quietly patient and persistent. As with the first two books, the tale extends well beyond a straight forward murder investigation, with Parker embedding the story within a wider narrative of local, national and international politics, and exploring themes of family, gender, honour, corruption and terrorism. As such, there’s an awful lot going on, though it never feels rushed or confused, and indeed the tale sagged a little bit in the middle as Makana makes little progress, before picking up in the last third as the tension and body count rises. It’s fair to say that there were quite a few plot devices used to make the whole thing hang together and the two denouements were somewhat contrived. 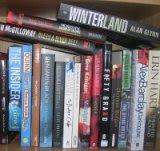 Nonetheless The Ghost Runner is an absorbing read.